Amy has Autism, ME, Fibromyalgia and functional neurological disorder. 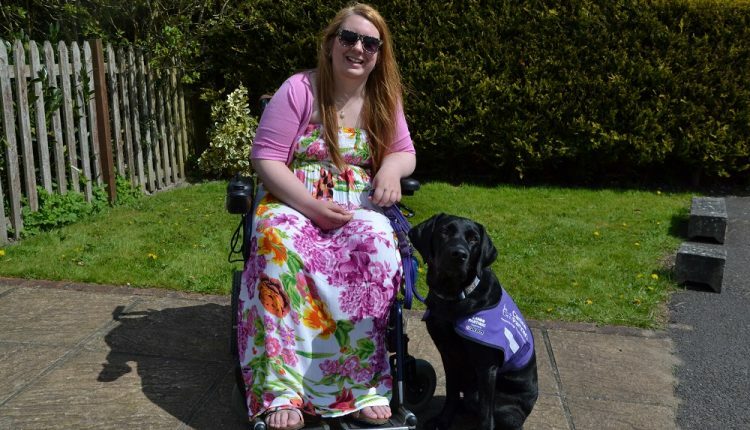 She was matched with canine partner Vida, a black Labrador, in September 2014. Amy has Autism, ME, Fibromyalgia and functional neurological disorder. She was matched with canine partner Vida, a black Labrador, in September 2014. This is her story. My life before Vida was very different. I was diagnosed with Dyspraxia when I was four years old and autism at 16 years old. My mum knew from when I was little that I had autism, as I was very late at reaching important milestones in my life. This included not being able to walk or talk until I was six years old. School was a very upsetting time for me, as I was badly bullied and struggled to keep up because of my learning difficulties. About eight years ago, my life changed forever. One minute I was stood up in the kitchen and the next minute I was on the floor with no feeling below the waist at all. I was admitted to the neurological ward at Southampton hospital, where I went through a series of investigations and was diagnosed with functional neurological disorder. Going into hospital caused problems for me, as due to my autism I couldn’t bear to be away from my mum and couldn’t cope with the unfamiliar situation, not having my usual routine and the loud noises. The hospital was very kind about this and put me in a side ward, but I would say being in hospital was the most frightened I’ve ever felt and I cried every night. Before being diagnosed with functional neurological disorder, I was also diagnosed with Myalgic encephalomyelitis (ME) and fibromyalgia. When I was diagnosed with autism I remember it certainly answered so many questions for me about why I am the way I am. Before Vida, I couldn’t even make eye contact or make conversation with people as it was hard for me. I couldn’t go into busy places as I couldn’t cope with the noises and had panic attacks. Even things that are considered fun, like the cinema, became almost impossible as I couldn’t bear to go out the front door because of how anxious I was. Mental health-wise, I was in a bad place. Due to my conditions, I am now permanently in a wheelchair, have to take various medications and have had to come to terms with a large amount of adaptions being made in my home. Coming to terms with being in a wheelchair has been a very difficult and emotional journey for me and my family. Before Vida, I was very isolated and anxious. The house was my safe place but it was also a prison. Because of my physical disabilities, I could never be left on my own because I wasn’t safe. It made me feel guilty, as I felt like I was causing pressure and stress on the people I love. When I went out I struggled as I felt like people were staring at me. I first heard about Canine Partners when I picked up a book in the library about Endal, the canine partner who changed Alan Parton’s life so much. I looked up Canine Partners on the internet and I remember feeling so excited that I had to show my mum. To begin with mum said no, but once she read more she said that I should definitely apply. I was inspired and moved when I read about Endal and when I read more about Canine Partners, I was so excited. I knew I needed help as I felt I was in such a low place and was scared because I was trying to come to terms with my physical disabilities. This was something I wanted more than anything in the world. Once I was going through the applications process I felt very supported and reassured throughout, which I am so grateful for. I remember when I found out I was matched with Vida, I literally screamed down the phone with excitement! On our way to meet Vida I was so excited I kept asking mum if we were nearly there yet. When I first met her, I was shaking with excitement and was crying with happiness. One of the first things Vida did when she met me was jump onto my lap. I think for both me and Vida it was love at first sight. When it was time to say goodbye on the matching day I was really sad as I didn’t want to leave her. My training course took place at my home. I was feeling a mix of emotions, but I remember feeling so happy and overjoyed to have Vida at home with me. I also felt nervous that I was going to struggle to remember all the commands. I felt so happy but occasionally would get upset and cross with myself for not being able being able to remember things. I was fatigued but determined. My advanced trainer, Cat, was fantastic and so understanding. She worked at my pace and understood my autism. It was a very positive experience. My life has completely changed in the most amazing and wonderful way. Vida in Spanish means life, and this is so true because she has given me my life back. Vida does many tasks to help me every day, which means my mum can leave me because she knows Vida cares for me and keeps me safe. Vida gives me so much independence, as I know she will support me and it means I don’t have to call on others to do things for me all the time. I feel so safe and loved. Vida always knows what to do when I am unwell or sad. Vida has opened up my world so much; she has helped me with coming to terms with being in a wheelchair instead of feeling self-conscious. I am more confident because my focus is on her and if she is okay. I go out and feel incredibly proud of Vida; she is so calm and makes me feel calm. I am more able to do things spontaneously and I am able to change my routine, make eye contact and hold conversations, which is a massive deal for someone with autism. Something important to me is that because of Vida I was able to say goodbye to my Nan, who had vascular dementia. Because of Vida, I was able to go and see my beloved Nan at the nursing home on a regular basis. She got very ill, which was very distressing to see and there were times I just burst into tears. Vida was amazing and would sit quietly by her bed. I got to see my Nan the day before she passed away and I couldn’t have done this without the unconditional love and support from Vida. Vida has certainly made my health better, she knows when I’m in a lot of pain and hugs from her really help. She has given me so much confidence that I have recently applied for volunteering work at Countess Mountbatten Hospice to help in the fundraising office. I now also want to learn to drive too. Vida is so lovable. The change to my confidence and my life has been amazing. The love me and Vida have for each other is unconditional. We watch Disney and Harry Potter films together; she has even been on the Harry Potter studio tour. I am hoping to take Vida with me to Disneyland Paris next March, so that will be a great adventure. Vida is my beautiful girl, my hero and my best friend. She means the world to me and has transformed my life both physically and emotionally in the most amazing way.